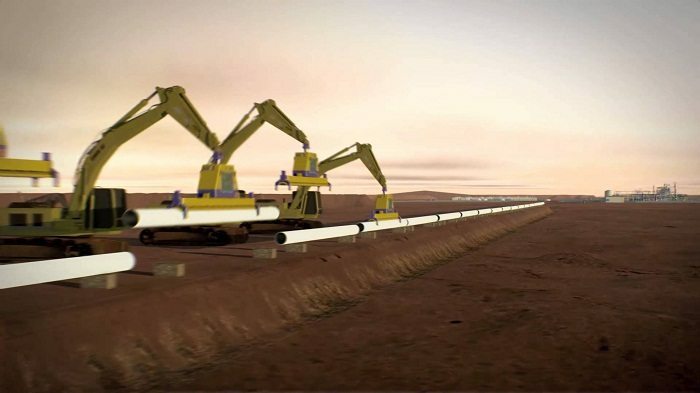 Nawara pipeline construction project in Tunisia is on track with 44% of construction work complete, Mongi Marzouk, Minister of Energy and Mining has announced. The Minister said that the multi-million dollar project is expected to be complete in few months time. It should be recalled that construction works after long explorations, bureaucracy and financial negotiations started in 2015 and the pipeline will be operational in 2017. This project which was decided by Mehdi Jomaa’s government stretches over 370km, that is to say the distance between the Nawara field in the south of Tunisia and the port of Gabes. With an estimated takeaway capacity of 10 million 3 / day, the project will include a gas treatment plant in Nawara gas field, south of the governorate of Tataouine. South Tunisian Gas Project (STGP) or Nawara project involves the installation of a central processing facility (CPF) at the Nawara well site for pretreatment of gas, a 370km pipeline, and a gas treatment plant (GTP) in the Ghannouch industrial district near the coastal city of Gabès. The source of gas for the project is the Nawara field, which is located in the Ghademes basin in south Tunis, 50km south-west of Hammouda and Oued Zar oilfields. The production wells of the Nawara field are named Nawara-1, Ahlam-1, Ahlam-2, Sourour, Fella, Ritma, Khouloud, Benefsej-1, and Benefsej Sud-1. The 50:50 joint venture (JV) of ETAP and OMV Tunisia will operate the South Tunisian Gas Project. Production from the project is expected in 2016. The Nawara field was discovered in June 2006 by drilling the Nawara-1 exploration well. The onshore well was drilled to a total depth of 3,970m and flowed at an initial rate of 5,970 barrels of oil per day and 58 million standard cubic feet per day of gas.